During the past few weeks I have been testing out EditShare’s beta of Lightworks. An NLE that has recently received a lot of attention, due to its use on the Oscar winning film “King’s Speech” , and mainly because it’s free. However it has also been used on other films such as Pulp Fiction, The Departed, Shutter Island, and Centurion. Lightworks is currently an open source NLE that improves upon itself with user feedback in each version release. Lightworks boasts some fantastic format support such as QuickTime, MXF, AVI, RED, Avid DNxHD, and Apple Pro Res, as well as many others. By keeping the application as an open source NLE, Lightworks is able to work with a variety of different I/O’s and third party plug-in supports. i.e. Boris, After Effects, OMF, AAF, Firewire, Matrox, and other RS-422 connections. Setting up Lightworks was simple enough on Windows 7 (64bit). Upon launching the application you are greeted with the initial set up for keys. You can set your keys for Lightworks, Avid or even Final Cut Pro. This is a very nice feature and helps reduce confusion later on. Importing the footage is very similar to any NLE, simply import your footage into your bins and you’re ready to begin editing. Lightworks may be a little difficult to learn especially for those of you who have never edited on a flatbed, or Avid. However, EditShare provide you with help from a “Shark” character in the bottom left hand screen. The Shark will give you handy tips to help you navigate throughout Lightworks features. One really nice feature in Lightworks is the Timecode Calculator. This is a great feature as I often would have to either refer to a third party solution, or an iPhone app. Being built in, it supports various formats from 35mm, NTSC and PAL formats. Fantastic! Lightworks also has professional features built in, such as a Vectorscope, Waveform, and Effect Transitions. It also supports all of your tool needs for cutting, such as Trim, Ripple, Insert, Overwrite, Drag and Drop. Lightworks also supports Stereoscopic footage, however, I did not have any footage at the time, so unfortunately I can’t say much on the matter. 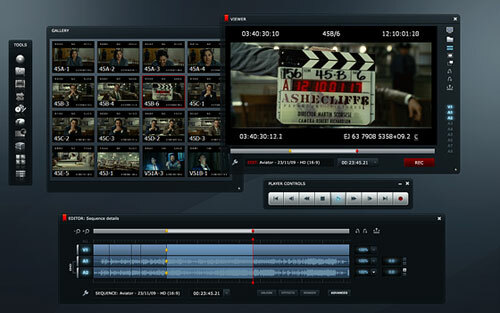 Exporting your edit can be performed with edit logs, including the video and audio. The formats supported for export are extensive, from QuickTime, EDLs, MXFs, 1080p and 2K full frame. All with various frame rate support, a very robust export tool. Of course with any beta there are technical glitches, and the odd crash. However, Lightworks auto saves your last decision every few moments, which includes window layouts. A feature that is both very impressive, and time saving. Editshare’s Lightworks is a very powerful NLE indeed. It feels as familiar as cutting on a flatbed, but as innovative as the latest offerings from the other major players such as Avid, Final Cut Pro and Adobe Premier. Once you understand the workflow, Lightworks is a very fast and powerful NLE. I can see why it has been used on so many Hollywood films. The only thing left is Mac support, which I have been told by Editshare should be available later this year! Lightworks is definitely an outstanding editing tool. So what are you waiting for? Go download the beta, and sharpen your teeth on something new. This blog rules i cant believe i finally found a Lightworks review! !